This week at ELEMENTAL JEWELRY, there is an addition to the Vintage line. When I make one of the vintage designs, I usually start by looking at photos of actresses and models from the era and make something I think one of them would have worn. You might find this design in the 1940's to 50's. Introducing...Vintage ~ Jane, Silver Necklace & Earrings with Texture Changing Stones set in a swirled bezel. 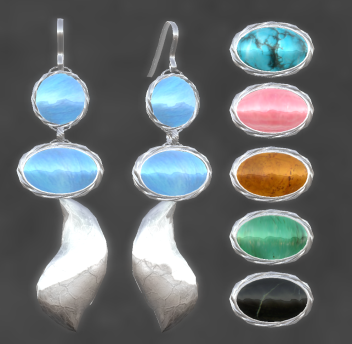 The stones can be changed to Blue Moonstone, Onyx, Amber, Turquoise, Emerald, and Rhodochrosite. Both the necklace & earrings are resizable, are sold separately, and will be in the 60L Weekend Sale this weekend only. Hair: Diva Hair Ema 2 in rhodolite, purchased at half price holiday sale. Skin: Curio Pout 2, Petal (dark)--Indulged 2, purchased at full price. Dress: Miamai Flora Blue, purchased at half price holiday sale. I'm at: Mieville Doyle Victorian Steampunk San Francisco.